1. Refrigerate the Paris Pâté cans for a few hours before opening them to get an optimal texture. 2. Put the Paris Pâté into a pastry bag with a plain pastry tip*. 3. Open the profiteroles and insert a small spoonful of your choice of apricot or fig jam in its cavity. 4. 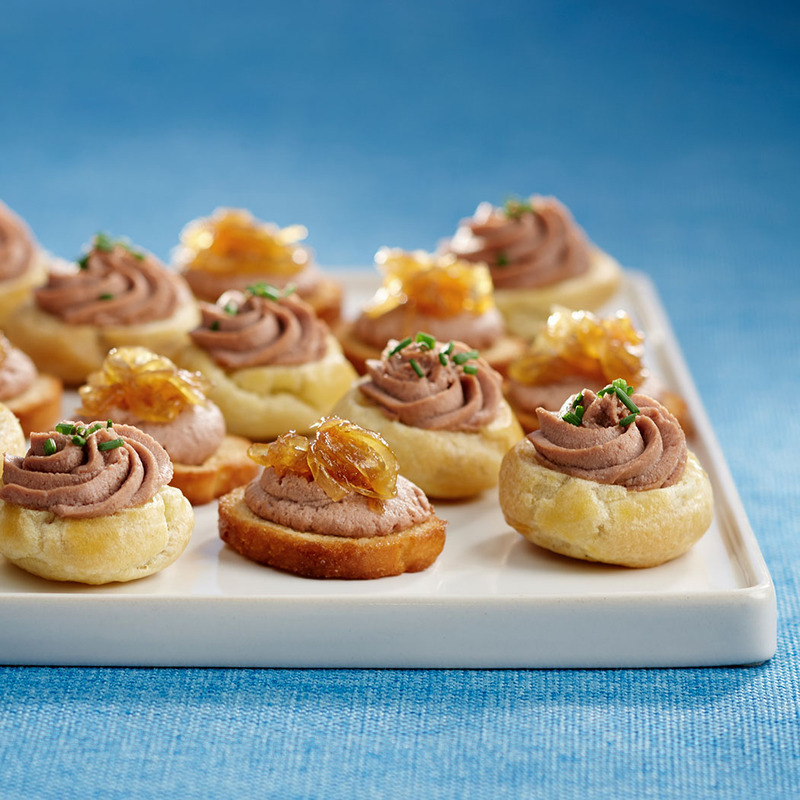 Fill the profiteroles with a rosette of pâté, pressing gently into the pocket with a circular movement. 5. Sprinkle the chopped up chives on top of each. Serve. Variation: Replace the profiteroles by mini vols-au-vent! * Tips: Don’t have a pastry bag? You can simply use a medium sized Ziploc bag. Fill a corner of the bag with Paris Pâté and push it down gently to squeeze out any air bubbles. Cut the very tip of the corner of the bag with scissors to make an improvised pastry bag. 1. Melt the butter in a non-stick pot on low heat. 2. Add onions and cook for around 15 minutes, stirring a few times. 3. Add the maple syrup, then a little salt and pepper, mixing to coat the onions well. Cook for another 5 to 10 minutes on very low heat until the onions have caramelized. Let cool completely*. 1. Spread a little Paris Pâté on each cracker. 2. Garnish with a bit of onion confit and serve. *This onion confit can keep for several days in the fridge in an air tight container such as mason jar. You can also serve it with your favourite cheese, in a sandwich, with steak, etc.